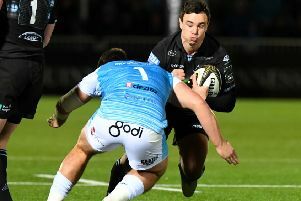 Edinburgh will go into their final match of the season at home to Cardiff Blues today without star forward John Hardie after coach Alan Solomons revealed the Scotland flanker’s race is run. There remains a slim chance that Edinburgh could make the Guinness Pro12 top six and secure a Champions Cup spot if they win by a bonus point this afternoon and other results go their way but Solomons said that the New Zealand-born player is feeling the effects of a gruelling run of games and has opted for Hamish Watson at openside. For his part, Watson is delighted to get his chance and said: “John has played a lot this season and international games can take it out of you. Maybe he’s a bit tired, I don’t know, but I’ve got the nod and hopefully I can play well and make the most of the opportunity. Watson is one of four changes to the side who lost to Munster in Cork last week and, barring a miracle, kissed goodbye to their season’s goal of a top-half finish. Dougie Fife will play his final game for the club after his end-of-season release was confirmed earlier in the week, replacing Blair Kinghorn, who took a head knock in Ireland, at full-back. In the pack Rory Sutherland comes in at loosehead for Alasdair Dickinson, who has a back injury, and Nasi Manu returns from a long injury lay-off to fill the blindside berth. Outgoing centre Andries Strauss will play his 50th and last game for the club and form a midfield partnership with another departee, Matt Scott, who is off to Gloucester in the summer. Solomons has called for one final push from his troops but admits it is difficult to see them ending the day in the promised land of the top half. “It will be very tough because you have to depend on results going your way as well as our own game against Cardiff,” said the South African. “This league has become exceptionally tough. There are nine sides who can all beat each other. There is no doubt that a third successive season outside the top six would be a huge disappointment, but Solomons is adamant that the club is improving. “I think we’ve made progress,” he insisted. “For us to say we have attained what we want to attain we would have to have made the top six. That’s the key for us. Cardiff will be missing Wales captain Sam Warburton through injury but welcome back the Test duo of Lloyd Williams and Tom James.